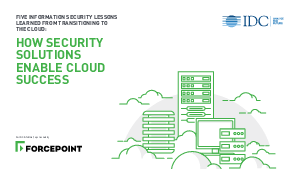 IDC Infobrief: How Security Solutions Enable Cloud Success Cloud applications have transformed how organizations conduct business, increasing productivity and reducing costs. However, moving to the cloud means critical data now flows outside the organization’s traditional security boundaries. Unsurprisingly, security concerns still rank as the number one reason for not using cloud services*.